Blog Tino – Welcome to my blog guys,,, On this sesion i will explain how to make a website with google product, okay now i will start. First of all you must know what is website or blog, website is a place for make content in the internet so if you have website or blog you can make content in internet and you can share that with your friend, famili and other. You must have a planning for your website, what would you do with your website? that for first. How serious you with your website? Second.Second, You must choose platform of your website. On this sesion i use blogger platform because it relevan with the keyword this content. Third, How often you will make content for your website, this part is a main of your website growth, because content is king in the internet. Four, Design of your website, with good design and make visitor happy stay at your website long time. These just point of making website you can remove point number one, four. Because not with that you can make website just with two point second and third. Why? Because if you don’t have platform you can’t build website and if your website no content for what you build website? Okay now i will starts tutorial for build website with blogger platform as product of google. Now you was sign in google and you automatic can loggin in blogger platform, now you can create your website. 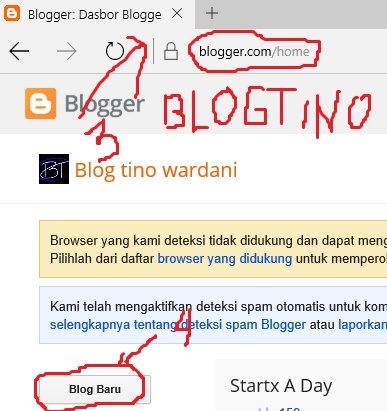 After you open blogger.com you see button new blog you can click right there you can insert what is your name of your website and link of them. Content is king, so this way you must make good content if you want your website famous. For adding you can change your theme of blog with good theme because it can make your website famous to and know of people. Now you was make a website with google product, Happy ending or sad ending is your choice. See you guys, i just give this for you….!!! the last one is i want to say sorry if my english language is bad…….!! !